An extinct ecomorph of the gray wolf (Canis lupus) roamed North America from Beringia to at least as far south as Wyoming during the Late Pleistocene. (See: https://markgelbart.wordpress.com/2016/05/30/beringian-wolves-an-extinct-ecomorph-of-canis-lupus-lived-as-far-south-as-wyoming/ ) Beringia included the unglaciated region of Alaska, the Yukon, and the Bering Strait located north of the Ice Sheet that covered most of Canada then. The Bering Strait emerged above sea level during Ice Ages. An ecomorph is the regional variation of a species that differs morphologically from other populations of the same species. Beringian wolves had bodies closely resembling those of gray wolves, but their teeth and jaws were larger and more robust like those of the extinct dire wolf (C. dirus). Paleontologists interpret the larger teeth and jaws as an adaptation for preying and scavenging on megafauna. Isotopic evidence of Beringian wolf bones does suggest they fed upon mammoths, horse, bison, musk-ox, and caribou. Beringian wolves were not ancestral to modern day Alaskan gray wolves, but they do share a common ancestor. Genetic evidence suggests Beringian wolves diverged from wolves found in northern China and Mongolia today about 28,000 years ago. Present day Alaskan wolves descend from a different population of wolves than the Beringian wolves which became extinct about 7500 years ago. Map showing location of sites where Beringian wolf bones have been discovered and the proposed route from Beringia to Wyoming. I hypothesize they occurred as far south as the southern Appalachians. I hypothesize Beringian wolves were an hybrid species originated when gray wolves interbred with dire wolves. This hypothesis will be possible to test when scientists are able to extract DNA from a dire wolf fossil. There are thousands of dire wolf specimens from the La Brae Tar Pits, but the tar in the bones prevents DNA extraction. Many specimens of dire wolf have been found in Florida as well, but humid conditions here cause DNA to deteriorate. I also hypothesize Beringian wolves were more widespread than the fossil record indicates. Over much of the continent fossil evidence of canids consists of isolated teeth and bones difficult for scientists to differentiate between gray wolf, Beringian wolf, dire wolf, and even large Pleistocene coyote. For example 1 wolf tooth found at Ladds Cave in north Georgia was identified as belonging to a gray wolf by 1 paleontologist, but another scientist ruled it fell within the size range of a dire wolf. Maybe this specimen came from a Beringian wolf. 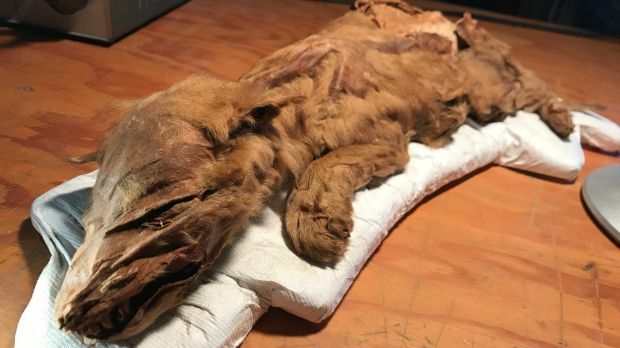 80,000 year old mummified wolf pup found in a Yukon gold mine. Note the coat color. It’s is a brownish blonde. During June of 2016 gold miners discovered the mummified remains of a wolf pup. As the photo shows, it was perfectly preserved. Carbon dating of the specimen indicated it was older than 50,000 years–the upper limit of carbon dating. However, the specimen was associated with volcanic ash dated to about 80,000 years BP. This predates the 28,000 year old divergence between Mongolian wolves and Beringian wolves, so it will be interesting to learn how this specimen relates to later populations of wolves. Julie Meachen of Des Moines University will lead a study of the pup. The coat color of this specimen surprises me. Of all the speculative illustrations of Pleistocene wolves none depict a golden, blonde, or tawny colored coat. This specimen appears to have a coat color similar to a lion but a little darker. Perhaps preservation in permafrost for so long changed the original color of the coat but suppose this was the color. The coat color likely resembled the landscape background of its habitat. Patches of yellow grass interspersed with bare dirt predominated in Beringia and much of North America during Ice Age stadials when precipitation was scarce and temperatures dropped. It’s possible packs of yellow dire wolf/gray wolf hybrids lived throughout parts of North America for thousands of years. Jessica Neal and Virginie Rolland, scientists from Arkansas State, published a paper in Southeastern Naturalist about their research of bluebird nesting boxes, and they mentioned “euthanizing” non-native house sparrow nestlings that they found occupying the nest boxes intended for bluebirds. This irritates me for several reasons. I hate the use of the word, euthanize, because it was used to sanitize what they actually did. They killed helpless baby birds. Many people kill house sparrows because this species outcompetes native birds such as bluebirds, swallows, woodpeckers, and unestablished purple martins. It is too bad these species may be in decline, but when she killed the house sparrows that were occupying that site there were then fewer birds occupying that area. Bluebirds probably weren’t going to return to that site during that nesting season, and there is no guarantee they ever will. Without the house sparrows there was less avifauna for bird watchers to enjoy. I also don’t like the way they played God by deciding which species they wanted to live there. Some may say humans already decided to play God by introducing house sparrows to North America in 1852 when ironically they were brought to New York to control native linden moths. I reject this argument. Humans shouldn’t pick an animal to introduce, then decide they don’t want it any more and try to eradicate it. Not only are humans playing God, they are playing a fickle God in this case. Not even the worst Old Testament version of God was this monstrous. House sparrows are a commensal species with humans. I love house sparrows because they thrive where few other birds can. Every grocery store shopping center hosts a colony of house sparrows, and they often live in the patio section of big chain lawn and garden centers. This habitat is completely unsuitable for native songbirds. The only other bird species I see in suburban parking lots are city pigeons (also non-native) and ring-billed gulls during winter. But house sparrows are abundant in these otherwise barren urban environments where they feast on discarded junk foods and fill the atmosphere with their delightful singing. The house sparrow (Passer domesticus) originated in the Middle East having evolved from P. predomesticus following the development of agriculture. Fossil remains of P. predomesticus have been unearthed from Qumm-Quatufa Cave in Israel that date to the mid-Pleistocene. House sparrows may have already been a commensal species with archaic humans, hanging around their garbage middens. Late Pleistocene remains have also been discovered from Kebara Cave in Israel. Genetic evidence suggests P. predomestica diverged from the Spanish sparrow (P. hispaniolensis) about 100,000 years ago. Another genetic study suggests P. domesticus evolved larger skulls and an improved ability to digest starch 11,000 years ago–the dawn of the agricultural era. The larger skulls helped them crack human-grown grains, and the improved ability to digest starch let them survive on an heavy diet of wheat, rye, and oats. They became less dependent upon insects than their wildest remaining subspecies P. domesticus bactranius. Unfortunately for other songbirds, their larger skulls gave them greater biting and piercing force, and this allows house sparrows to outcompete them. House sparrows followed humans throughout Europe and Asia where they continued to feast on grain spillage and nest on housing structures. This close association with humans let house sparrows conquer the world wherever humans became established. House sparrows were formerly even more abundant when the horse and buggy were the most common mode of transportation. In addition to excess grain spillage house sparrows ate the undigested grains in horse manure. But the introduction of the automobile dealt a little setback to house sparrow populations, reducing the amount of grain and manure in the environment. Nevertheless, a trip to the local grocery store is all it takes to see them. For millions of years mild climate allowed soil to build in Canada and the northern regions of Eurasia. Plants and animals lived and died and their remains turned into thick layers of top soil. The uplift of the Himalayan Mountains and the Rocky Mountains and the emergence of a land bridge between the Americas changed climate patterns that then became triggered by the Milankovitch Cycles. (See: https://en.wikipedia.org/wiki/Milankovitch_cycles) Ice Ages began to occur during the Pliocene over 3 million years ago. At first Ice Ages lasted for 40,000 years before cycling into interglacial periods. But about 950,000 years ago Ice Ages began to last for 100,000 years, and they became more severe. Scientists found evidence suggesting this is when glaciers began to scrape into bedrock instead of the deep soil built up during the Miocene and early Pliocene. Whereas glaciers slid over soil during earlier Ice Ages, they instead became stuck in bedrock and grew thicker. Earlier Ice Sheets repeatedly drove into soil and with each Ice Age stripped the soil until 950,000 years ago it finally reached the bedrock. 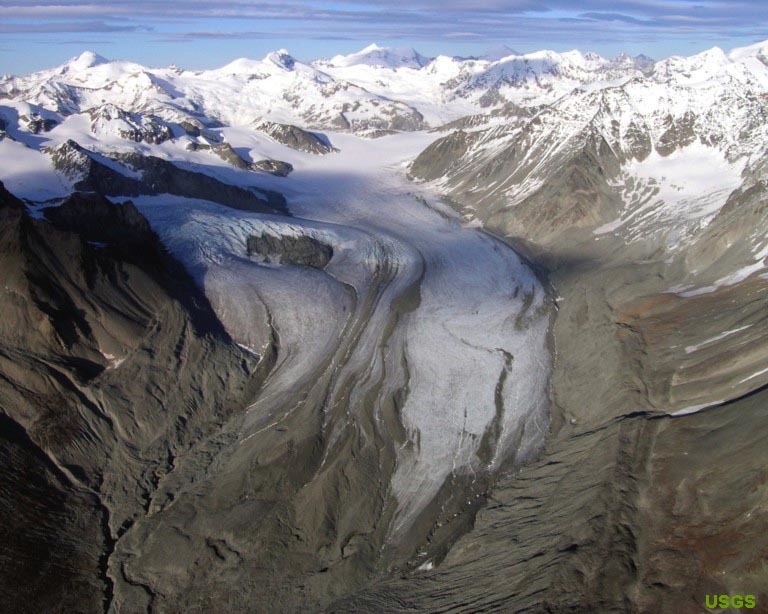 The increased size of the glaciers caused an increase in the length and severity of Ice Ages. Graph showing increased length of Ice Ages. Glaciers reached bedrock about 950,000 years ago. Repeated glacial advances eventually stripped away deep layers of top soil. Later Ice Ages produced glaciers that got stuck in bedrock and grew thicker. The evidence for changing Ice Age rhythms comes from deep ocean cores taken from the South Atlantic. Scientists noticed the sudden influx of isotopes that are more common in the Pacific Ocean in the section of cores dating to 950,000 years ago. These isotopes of neodymium originate from young volcanic islands located in the Pacific Ocean, and the rock sediment erodes into the ocean and gets carried by currents into the South Atlantic. Normally, older rocks from coastlines surrounding the North Atlantic Ocean with a different ratio of neodymium isotopes erode and wash into the sea, and they predominate. But normal ocean circulation shuts down during Ice Ages, and more water from the Pacific Ocean makes its way into the North Atlantic. Drastic climatic fluctuations occurred during Ice Ages. Sudden warm spikes in average annual temperatures followed by rapid onsets of much colder climate phases altered the quantitative composition of plant species in the environment. In most of North America oaks and other broad-leafed trees increased in abundance during warm wet interstadials but waned during arid cold stadials when coniferous parkland forests consisting of pine and spruce expanded in response to the changing climate. These fluctuations were part of a feedback loop. The warmer temperature phases gradually caused giant ice dams to weaken and break. Torrents of cold freshwater from glacial lakes with floating icebergs flooded the North Atlantic, shutting down the Gulf Stream which during present day conditions moderate temperatures. These deluges of iceberg studded meltwater are known as Heinrich Events, and they caused average annual temperatures to drop by 15-20 degrees F within decades. In response to the drop in temperatures the Ice Sheets expanded for thousands of years until the next warm phase. Climate also became drier because moisture for potential precipitation became locked in glacial ice. However, evidence from a lake in south Florida suggest climate there was out of sync with the rest of North America north of the Rio Grande. Graph depicting Heinrich Events and the subsequent fall in temperature. Pollen evidence from sediment in Lake Tulane, Florida reveals the floral response to these climatic shifts, including the most recent 6 Heinrich Events. Lake Tulane is located near Avon Park, Florida. Scientists have taken numerous cores of sediment from Lake Tulane, located in south central Florida. Lake Tulane is a very old body of water and has probably existed for almost 5 million years since this region emerged above sea level. The sedimentary record goes beyond the limits of radio-carbon dating (50,000 years). The pollen composition in these cores shows the local environment’s response to Heinrich Events, but curiously it is the opposite from that of the rest of North America. When the rest of North America experienced a warm wet interstadial, south Florida became cooler and drier (though mostly not sub-freezing). The landscape transformed into an environment dominated by scrub oak, Florida hickory, red cedar, ragweed, grass, asters, staggerbush (Lyonia sp. ), and rosemary (Ceratiola). Scrub oak thickets surrounded by open spaces prevailed. These are all drought-tolerant but shade-intolerant species, and red cedar is fire-intolerant, indicating the rarity of lightning-induced fires. Conversely, when the rest of North America suffered cold dry stadials south Florida was warmer and wetter and pine forests spread across the land because lightning-induced fire frequency increased, and pine is fire tolerant. Scientists find macrofossils of aquatic plants in the sediment representing dry phases because the lake was shallow enough to support emergent marsh vegetation, but these are absent during the wetter phases. A brand new study introduced a new line of evidence that supports assumptions based on the earlier pollen evidence. The authors of this study looked at variations in carbon and oxygen isotopes from Lake Tulane plant leaf waxes. Scientists can understand the historical precipitation characteristics by studying the isotopic composition of plant leaf waxes. (Plants synthesize organic compounds by using hydrogen atoms they absorb from water molecules. The isotopes vary depending upon their source.) They discovered that during climatic phases when scrub oak and ragweed dominated, average annual precipitation dropped by 22%. The source of precipitation was different too. Oak phase precipitation mostly came from storm fronts, but pine phase precipitation originated from tropical oceanic storms. The vice-versa climate of south Florida was tied to the shifting Gulf Stream. Under non-Ice Age conditions the Gulf Stream carries tropically-heated water to the North Atlantic as far as the coast of Canada, moderating temperatures. When it shut down following Heinrich Events, the warm water stayed near the coast of south Florida, keeping it warm and wet while the rest of North America suffered dry cold conditions. The Gulf Stream eventually restarted, bringing warmer wetter temperatures north, but this caused cooling and aridity in south Florida. I hypothesize the Gulf Stream periodically began to restart within stadials, then shut down with new influxes of meltwater. These partial changes likely influenced temperatures near the coasts of Georgia and South Carolina. The climate may have temporarily been warmer in this region even during colder climate stages, and the composition of species here may have varied as well, though it involved different species than the Florida endemics. Eventually, when the Gulf Stream restarted for longer periods, coastal Georgia may have experienced warmer climates centuries before northern latitudes of North America did. Common ragweed. It was much more common in south Florida during the late Pleistocene than it is today. There is no modern analogue for the abundance of ragweed (Ambrosia artemisifolia) in south Florida during the late Pleistocene. Ragweed prefers cooler nights than occur in present day Florida for germination, and its abundant presence during the late Pleistocene indicates cooler nights prevailed, even during the out of phase warmer climate stages. Ragweed is a tough plant that grows on disturbed sites such as abandoned agricultural fields and vacant lots. It produces up to 32,000 seeds per plant, so it is able to survive heavy foraging by herbivores. The seeds persist indefinitely and can wait for centuries before germinating when an environment transforms into a sunny one. This means it can lay dormant through several stages of forest succession, and then colonize the habitat when conditions become favorable. This may explain why it was so successful during the late Pleistocene when both sudden climatic fluctuations and megafauna foraging greatly disturbed and altered the landscape. Many animals consume ragweed. Rabbits and meadow voles eat the leaves while birds including juncos, cowbirds, quail, purple finch, mourning dove, goldfinch, and red-bellied woodpeckers eat the seeds. Rabbits and meadow voles were common in south Florida during the Pleistocene, though the latter is presently restricted to 1 county in the state. Farmers report livestock prefer giant ragweed (Ambrosia trifida) over clover. It’s unclear if this species lived in south Florida during the late Pleistocene. It is found in a couple counties, and this may represent relic populations, but they also may be invasive. Livestock will also eat common ragweed, though they don’t like it as much. Pleistocene megafauna such as horses, bison, and mammoth likely ate ragweed and grass, and they probably occurred in large herds during both climatic phases. Other species probably common during the oak phase were Harlan’s ground sloth, northern pampathere, flat-headed peccary, and giant tortoise. Flat-headed peccaries preferred thorny thickets, and the other 3 liked open environments. Predators such as saber-tooths, lions, jaguars, and dire wolves fed upon the herbivores. 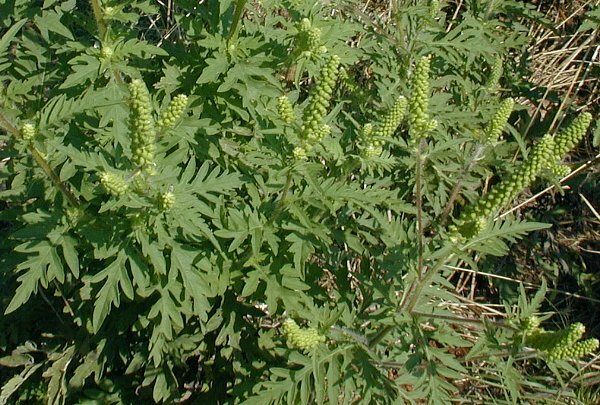 Ragweed survived megafauna foraging by producing large numbers of seeds, but 2 other plant species in this environment survived because their leaves were toxic–rosemary and staggerbush. I think both climatic phases in Florida supported approximately similar populations of megafauna. Arnold, T. Elliott; et. al. You are currently browsing the GeorgiaBeforePeople blog archives for September, 2018.